Rikvin’s Head of Operations, Mr. Satish Bakhda, was a resource speaker at the recent gathering of the Atlas 400, an exclusive group of high net worth individuals from around the world. Every few months, the Atlas 400 gathers in diverse locations worldwide to exchange ideas, socialize, and forge lasting personal and business relationships. On Tuesday, 19 November, its members gathered at the world-class Ritz-Carlton Hotel in Singapore. 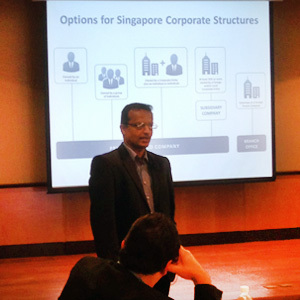 Discussing corporate structures in Singapore, Mr. Bakhda enumerated the various options for foreign corporate entities and entrepreneurs seeking to establish a presence in the city-state.